Beginnings can be difficult. 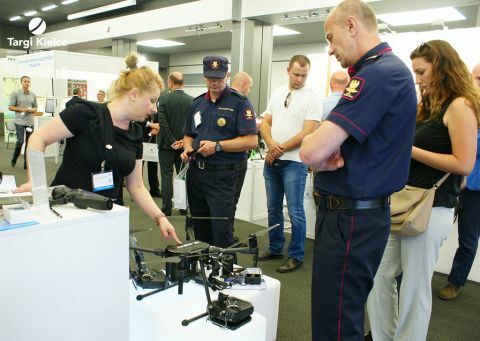 However expanding the Kielce exhibition and congress centre's calendar with a proposal for the Unmanned Aerial Vehicles industry has turned out to be a hit. The IDEa, i.e. the International Drone Event - annual stands the chance to position itself as an important meeting on the drones-focussed global map of events. The event was divided into four, complementary zones. The first - the EXPO zone was used by the industry giants to present their offering. The latest technologies were presented by, inter alia, PIX4D and DJI. Not only did the visitors have the chance to talk about technical properties, but also to see the drone performing live in a special shows zone. The combination of these zones resulted in the fact that the expo participants started to talk shop. - In my opinion as well as in team's opinion this is a promising expo - Katarzyna Niebrzydowska from DJI Dilectror recapitulates her company's expo participation - despite the low-scale format the interest in the event is huge. The guests are people in high positions, the decision-makers. We are very interested in participating in next year's IDEa expo. IGTNadowski - for 25 years the company has specialised in advanced technologies and solutions implementation for geodesy, civil engineering and other sectors of engineering. Nadowski - Poland's leading specialist in cutting-edge engineering technologies, Europe's general distributor of Altus Intelligence - the manufacturer of comprehensive, reliable, multi-task Unmanned Aerial Systems.